This unit will convert between digital coaxial S/PDIF audio and optical audio formats. All digital conversion so no signal loss or distortion for output sound to be perfect replica of the original input sound quality. This compact and convenient audio format converter accepts a stereo or surround 5.1 audio signal through either coaxial cable or optical cable, and passes the unchanged signal to both its coaxial and optical output ports at the same time. With its built-in signal enhancement feature, the unit also serves as a repeater of digital audio signals to extend up to double the transmission distance. With this digital converter added to your home theater system, users can simply change digital audio format from one to the other with the same clean, detailed and rich sound quality. This 2-way digital audio converter can transcode from digital coax S/PDIF audio to optical audio format in real time for further decoding by your amplifier. This 2-way digital audio converter can also transcode from optical audio to digital coax S/PDIF audio format in real time for further decoding by your amplifier. This unit is operated as digital audio switch with one fiber optic Toslink jack input and one coaxial input. A dip switch on the side for easy selection of your digital audio source. Used as an digital audio splitter when feeding 1 digital audio input to to this unit with 2 simultaneous digital audio outputs in both coaxial and optical format. This unit can also be served as a signal repeater to extend the distance of your digital link for longer cable run. Chain two audio cables together to extend the cable run distance by buffering the digital signals received from the the source and amplify the signal to the second cable for the extension. 2-Way digital audio format converter switcher with 1 optical audio input and 1 coaxial S/PDIF audio input. Transcode from digital coax S/PDIF audio to optical audio format in real time for further decoding by your amplifier. Transcode from optical audio to digital coax S/PDIF audio format in real time. Change digital audio format from one to the other with the same clean, detailed and rich sound quality. Designed to bridge the gap between home theater components with different audio input/output in digital formats. Supports all digital stereo or surround (up to 5.1 channels) audio signal through either Coaxial cable or Optical cable, and passes the unchanged signal to both its Coaxial and Optical output ports. Supports amplification of digital S/PDIF source through coax and/or Optical link cables. Doubles as a digital audio repeater to extend audio cable runs with no loss of digital audio quality . 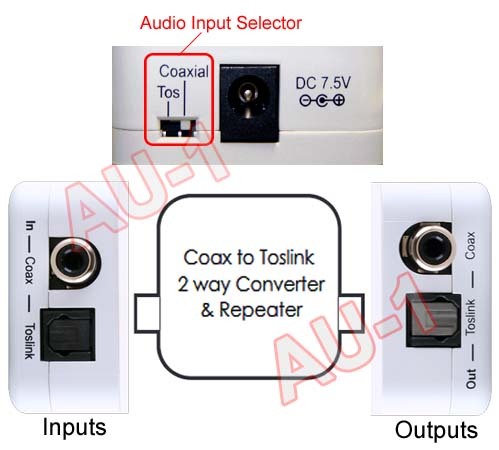 2 digital inputs: 1 Toslink optical fiber + 1 RCA coaxial jack. 2 digital outputs: 1 Toslink optical + 1 RCA coaxial jack. Power Consumption: DC 7.5V /500mA , center positive.